Oh, and three grown old men cut in line in front of me. Their mothers would be so ashamed. I have been wanting skinny, shorter black pants (ala Audrey Hepburn) for years and years. I know they are out there and I ordered a pair once from The Gap, but they didn't fit and were sold out when I tried to send them back. For the most part and time being, I'm no longer buying new clothes, so this has left me mostly to my own devices. 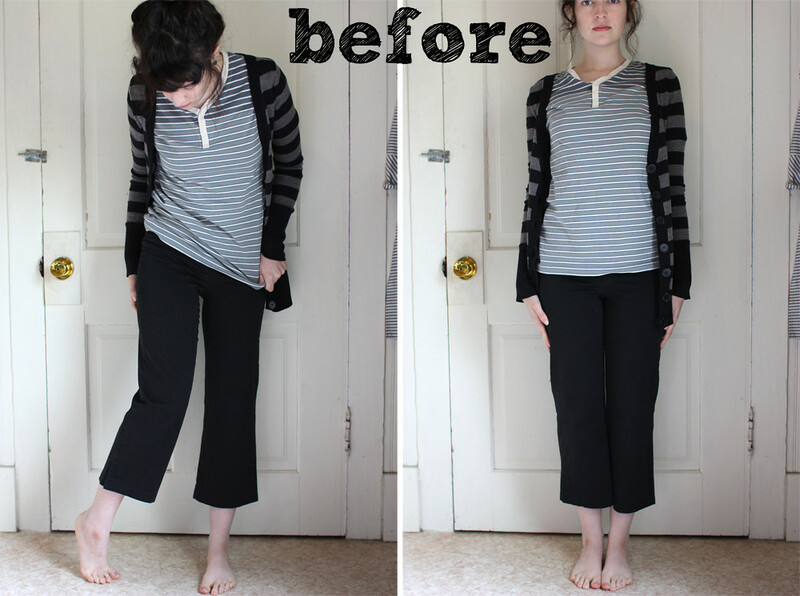 I bought these wide leg black pants years ago for $4 from a thrift store when I was in need of work clothes. I like the fit, just not the cut so I've saved these pants in the bottom of countless "to mend" piles and finally put them to good use! Try pants on inside out in front of a mirror. Now... enjoy your new pants! If these instructions were just really confusing, excuse my poor wording/explaining skills and email me! This is the cutest thing! Thank you for posting. I don't know how to sew at all, so this probably would never work for me haha. But you did a great job on them and that yellow bow belt is delicious. Fantastic tutorial! 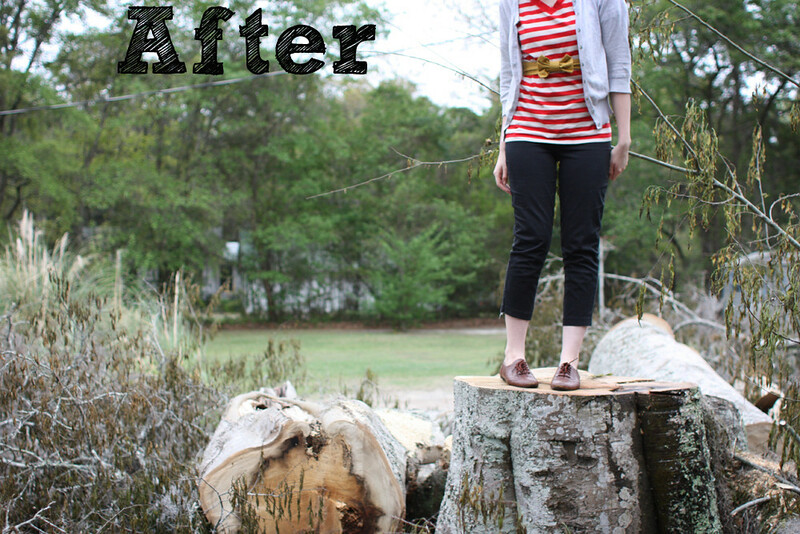 I love re-purposing castoff clothing items and giving them a new life. 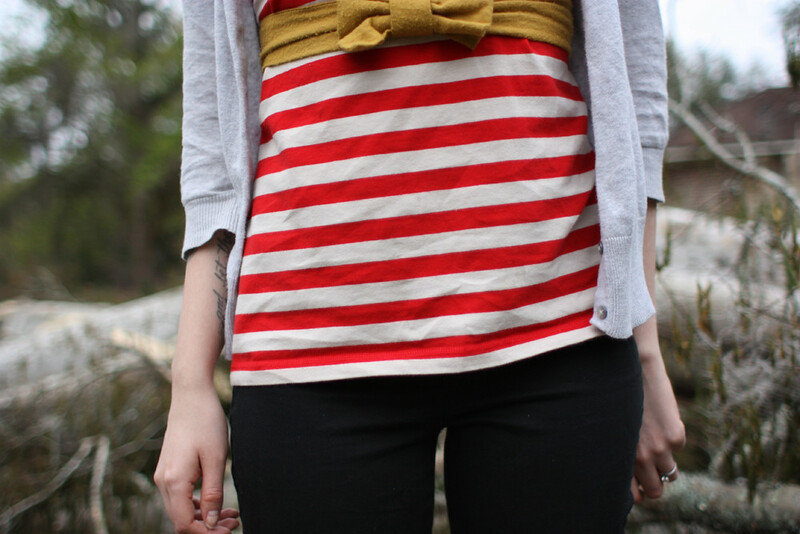 The whole outfit is so adorable - I love those cheerful red stripes. :) Hope you manage to make it home from the airport soon! This is great! They turned out amazing! And I really love your belt too. 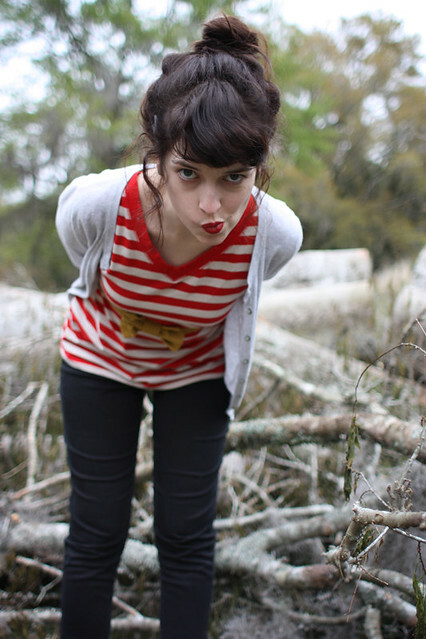 Your whole outfit is adorable. This looks so easy and effective! The pants look awesome....yay, I'm going to try this myself. i've been wanting to give this a try for a while now with some of my pants, happy to see it's super easy and quick. now i just need to take the plunge and give it a try! i couldn't find your email to ask you my question, so i will leave it here, and i apologize in advance if the answer is totally obvious, i'm new to using a sewing machine. 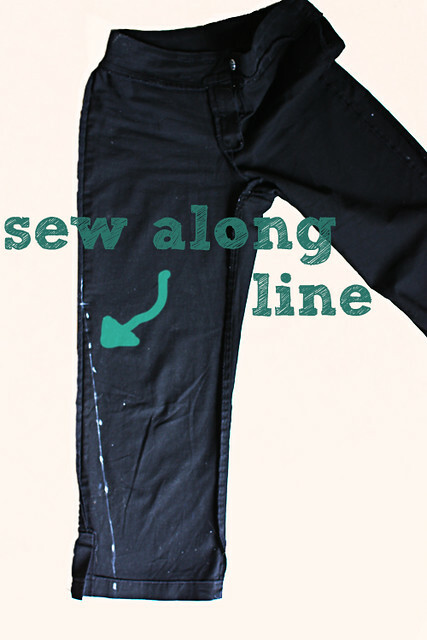 when sewing the pants, they need to be inside out, correct? Love this! I almost feel dumb for not thinking of it myself! I actually just got some really cute jeans from my aunt and the bottoms are too wide for me so this is perfect! Thanks!! i'm a seamstress but i've never tried making skinny jeans from my old jeans before! my new skinnies look great!